Magnesia or magnesium oxide (MgO) is a white hygroscopic solid mineral that occurs naturally as periclase. It forms magnesium hydroxide in the presence of water [MgO + H2O = Mg(OH)2], but this reaction can be reversed by heating magnesium hydroxide to separate moisture. Magnesium (Mg) is the eighth most abundant element and constitutes about 2 percent of the crust of the earth. It is the third most plentiful element dissolved in seawater, with a concentration averaging 0.13 %. Although magnesium is found in over 60 minerals, only dolomite, magnesite, brucite, carnallite, and olivine are of commercial importance. Magnesium and magnesium compounds are produced from seawater, well and lake brines and bitterns, as well as from the above mentioned minerals. Magnesite (MgCO3), the naturally occurring carbonate of magnesium (Mg) is one of the key natural sources for the production of magnesia (MgO) and subsequently fused magnesia. It is the world’s largest source of magnesia. It contains a theoretical maximum magnesia content of 47.6 %. It occurs in two distinct physical forms namely (i) macro-crystalline and (ii) crypto-crystalline. Crypto-crystalline magnesite is generally of a higher purity than macro-crystalline ore, but tends to occur in smaller deposits than the macro-crystalline form. The word magnesite literally refers only to the natural mineral, but common usage applies this name to three other types of materials, dead burned magnesia (DBM), electro fused magnesia and calcined magnesia also called caustic calcined magnesia. Often magnesia word is replaced by magnesite in these products. These products of magnesite often differ mainly in density and crystal development that results from different levels of heat application. The three products of magnesite are shown in Fig 1. Magnesia is an alkaline earth metal oxide. Magnesium oxide is normally produced by the calcinations of naturally occurring minerals mainly magnesite. Other important sources of magnesium oxide are seawater, underground deposits of brine and deep salt beds from which magnesium hydroxide is processed. The general properties of magnesia is given in Tab 1. Magnesia is a refractory material which is physically and chemically stable at high temperatures. Refractory industry is the largest consumer of magnesia worldwide. The terms dead burned magnesia (DBM), electro fused magnesia (EFM), or refractory magnesia are used predominantly in the refractory industry where they are mainly used to make shaped and unshaped products to line high temperature vessels such as furnaces and kilns in the steel, cement, non-ferrous, glass and chemical industries. The terms refer to the granular product produced by firing of magnesite, magnesium hydroxide, or another material reducible to magnesia at temperatures which normally exceeds 1500 deg C. The heating process is to be of sufficiently long duration to produce a dense, reasonably weather stable granule for use in manufacturing refractory materials. Dead burned magnesia (often called dead burnt) is used almost exclusively for refractory applications in the form of basic bricks and granular refractories. Dead burned magnesia has the highest melting point of all common refractory oxides and is the most suitable heat containment material for high temperature processes in the steel industry. Basic magnesia bricks are used in furnaces, ladles and secondary refining vessels. Electro fused magnesia is superior to dead burned magnesia in strength, abrasion resistance and chemical stability. The terms high grade and high purity generally refer to a refractory magnesia containing more than 96 % MgO, a density greater than 3.30 g/cc, preferably 3.40 g/cc, and a proper relationship of auxiliary oxides. Magnesia is used in the steel industry as a refractory brick impregnated with tar, pitch, graphite etc to give optimum properties for corrosion resistance in environments of basic slags. Calcined magnesia is used in steel making to modify the properties of steel making slags during steel making as well as to change slag characteristics for slag splashing in BOF vessels. The main application of magnesia is in steel refractories with more than 70 % of all type of magnesia refractories used in steel production and continuous casting operations. High grade DBM and EFM are used mainly in bricks/shapes to produce the following refractories. DBM is mostly used in the manufacture of basic monolithic refractories such as gunning repair products, tundish working linings and precast shapes (tundish dams/weirs). Applications for sintered magnesite include isostatic pressed shapes and flow control systems (sliding gate plates etc). High grade magnesia for refractory applications is classified according to purity (MgO content), bulk specific gravity (BSG), periclase crystal size (PCS) and CaO/SiO2 ratio. When the grain size of the magnesia crystal is large then its stability is very good. Typically, high grade DBM for the steel industry requires MgO content of 97 % minimum, BSG of 3.40 minimum, PCS of 100 microns minimum and CaO/SiO2 ratio of 2.0 minimum. The addition of fused magnesia grains can greatly enhance the performance and durability of basic refractories such as mag carbon bricks. This is a function of a higher bulk specific gravity and large periclase crystal size, plus realignment of accessory silicates. Refractory grade fused magnesia has exacting specifications and is normally characterized by the following. Due to its relatively high chemical stability, strength and resistance to abrasion as well as excellent corrosion resistance, refractory grade fused magnesia is used in high wear areas in steel making. Lower grade EFM is also used in refractory bricks and shapes. EFM also has high thermal conductivity. Calcined magnesia is normally graded according to purity, sizing and reactivity. Most of the calcined magnesia produced has MgO content ranging from 85 % to 95 %. It has a loss of ignition (LOI) value of less than 10 % and has a high reactivity which means that it has got high absorbing capacity for water vapour and CO2. Historically the main global producers of high grade DBM have been based on synthetic technology converting magnesium rich seawater or brine into magnesia. The only natural high grade DBM producers are Turkey and Australia which are based on cryptocrystalline magnesite deposits. MgO is produced by the calcination of MgCO3 or Mg(OH)2 or by the treatment of magnesium chloride with lime followed by heat. Calcining at different temperatures produces magnesium oxide of with different reactivity. 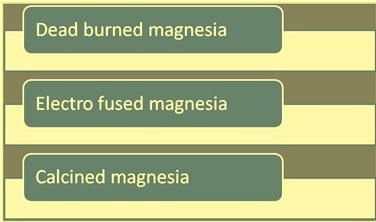 High temperatures (1500 deg C to 2000 deg C) produces dead-burned magnesia, an unreactive form used as a refractory. Calcining temperatures (1000 deg C to 1500 deg C produces hard-burned magnesia which has limited reactivity while lower temperature, (700 deg C to 1000 deg C) calcining produces light-burned magnesia, a reactive form, which is called calcined magnesia. Magnesite is converted into magnesia by the application of heat which drives off carbon dioxide (CO2), thereby converting the carbonate to the oxide of magnesium (MgO). Magnesite, from both natural sources (primarily magnesite) and synthetic sources (seawater, natural brines or deep sea salt beds), is converted into calcined magnesia by calcining to between 700 deg C and 1000 deg C, driving off most of the contained CO2. Calcined magnesia is both an end product and an intermediary step in the chain of magnesia products. Further calcining of magnesite at higher temperatures between 1500 deg to 2000 deg C results in the largely inert product, dead burned magnesia. Heating to this level drives off all but a small fraction of the remaining CO2 to produce a hard crystalline non reactive form of magnesium oxide known as periclase. Dead burned magnesia exhibits exceptional dimensional stability and strength at high temperatures. Fused magnesia is produced in a three phase electric arc furnace. Taking high grade magnesite or calcined magnesia as raw materials, 12 hours is required for the fusion process at temperatures in excess of 2750 deg C. The process promotes the growth of very large crystals of periclase ( greater than 1000 microns compared 100 microns for dead burned magnesia) with a density approaching the theoretical maximum of 3.58 g/cc. In fused magnesia production, the main constraints on capacity are the size and number of electric arc furnaces, and the cost of energy. The manufacture of fused magnesia is very power intensive with electricity consumption varying between 3500-4500 kWh/ton.